Do you want to be part of creating the future textile and fashion industry? 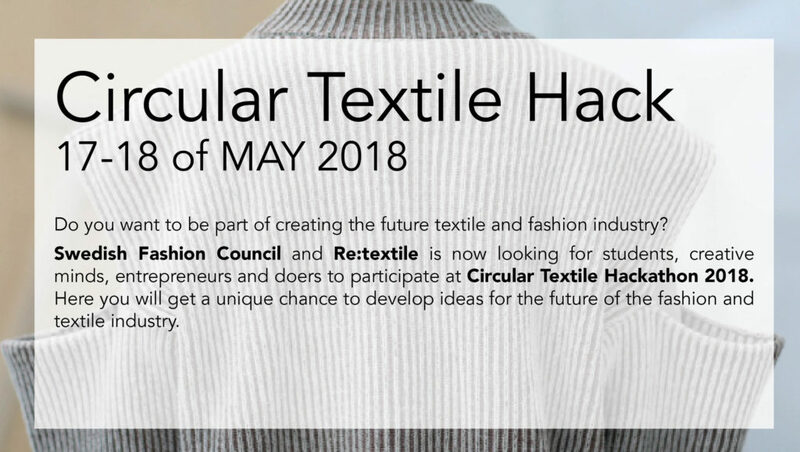 Swedish Fashion Council and Re:textile, Science Park Borås is looking for students, creators, entrepreneurs and innovators for Circular Textile hackaton 2018. Here you will get a unique chance to develop ideas for the future of the fashion and textile industry. During two hackathons you will work in teams together with fashion- and textile companies, identifying solutions for existing challenges to make the textile value chain circular. The companies participating are Velour by Nostalgi, Göteborg Manufaktur, Kinnarps, Korallen, Trust Trace och Wargön Innovation. The time is NOW! There is a great potential for innovative business models that focus on reuse, repair and re-manufacture / re: design. With increasing consumer and organizational awareness, more companies put emphasis on circular economy, making it essential to their business models. But today consumer choice are too few, right? Now you have the chance to revolutionize the industry. We ask YOU – how do we go from linear to circular fashion? What does the program consist of? The events in a nutshell! The first hackathon will take place 17-18 May 2018 and will take place in the Do-Tank Center in Borås. The second hackaton that is a follow-up to the first is scheduled to take place during World Waste Week 22-23 November 2018. The time between the teams is offered to participate in an accelerator program to develop the idea further. Where: Do-tank Center, Marketplace Borås. Profiles we are looking for? We are looking for you as an innovator, entrepreneur, inventor, student, maker or shaker – to jointly develop new innovative solutions that revolutionize tomorrow’s ways of manufacturing, producing and consuming! During the spring of 2018, you will be matched to the program to be matched with established textile and fashion companies to team work with ideas, goods and services for a sustainable and circular textile industry. We are looking for a student in the fields of design, engineering, technology, sustainability, IT, app development or other relevant areas. In total, 30 people will be selected to participate in 5 groups with different skills. The purpose is to build new collaborations between established companies and new innovators to jointly create solutions based on circular economy for a sustainable fashion industry. Circular Textile Hackathon is part of the project Innovate Passion Borås, aiming to foster and support youth entrepreneurship for sustainable development. Innovate Passion is finansed by Vinnova. It is also part of the project Circular Textile Platform, where used textiles get a new, exciting life. In Sweden, 80 000 tonnes of textiles are disposed of in the bin every year. The project is unique because it covers all parts of the chain, from design and production for collection and sorting. It is financed by the Västra Götalandsregionen and Avfall Sverige.